Item: One final word on Platinumgate! Silly us. Just when we thought Nike would have SU wear that new platinum, reflective glossy orange jersey/shoes/striped-socks combo for a game on CBS such as Connecticut or Louisville to get two hours of a free national television infomercial, no, Nike instead wanted to shove its design work in the face of an opponent which is a non-Nike school, in this case South Florida, an Under Armour team, in the Dome on a Wednesday night in late February, only to be televised on the Big East Network (all nine games are Nike championship programs against either an Adidas or Under Armour school). » Do you like SU’s new uniforms? Discuss. Talk about an even more ridiculous scenario on Nike’s part, the press release surrounding this week’s unveiling said the jersey would be worn by its Nike clients “for some of the oldest and strongest rivalries in college basketball.” Yep, the ‘Cuse and Bulls, that’s some rivalry. When the teams meet Feb. 22 it will be the 10th all-time game. And, finally, come on, Nike. 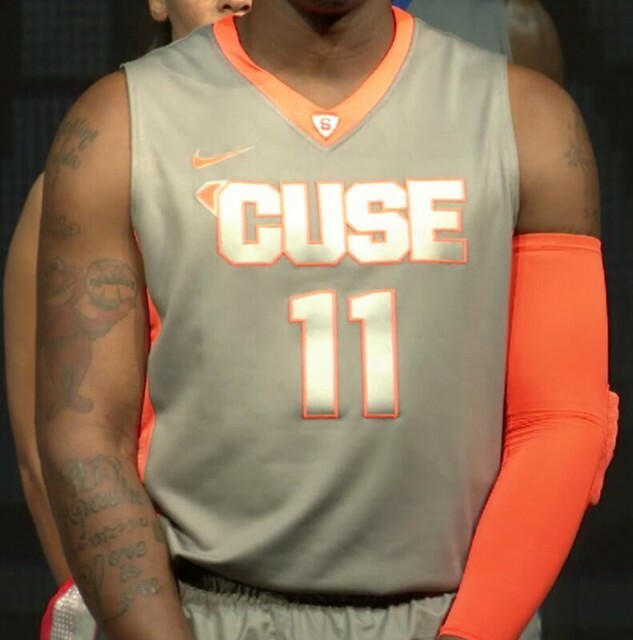 The wrong, reversed apostrophe in front of “CUSE” on the jersey front? Really? Item: The Big 12 is set to announce its 2012 football schedule by Feb. 1. How does that affect SU? 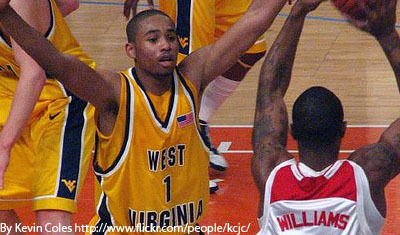 West Virginia’s Big 12-or-bust stance from day one should not have any impact on the Orange conference home this fall. According to athletic department sources we’ve spoken with; even as the Big 12 schedule is expected to include WVU, don’t expect the Orange and Pitt to escape and be ACC-bound until 2013-14. While a Rhode Island judge has ordered the Big East and WVU into non-binding mediation to decide on an expedited exit fee, reportedly over $20 million, to let the ‘Neers move their sports programs into the nation’s heartland and Texas, we’re told SU will be in the Big East for another year, and then should be able to make the move to the ACC for the 2013 football season. A Mountaineer departure would hurt all seven remaining Big East teams who would need to find yet another game. SU was already in need of two games to fill its upcoming schedule before the WVU departure, and we’re told work to fill those two slots is almost completed. Item: All but one of the SU lacrosse team’s games will be on TV this season. Is the sport going mainstream? When ‘Cuse lax won the first of its record 11 titles in 1983, the game was televised on tape delay a week later on CBS, as part of its deal to televise the ever-growing NCAA basketball tournament which it snared from NBC a year earlier. This season, only the Orange’s road game at St. John’s will not be televised live either in Syracuse on Time Warner and New York City via SNY-TV, or one of the ESPN networks as the sport’s increasing popularity helps it fill the many programming hours available especially in the spring, and in the case of SNY, before Mets baseball gets underway. But mainstream? We’re still not so sure, especially when 61 schools played at the Division I level last season, with the majority offering only partial scholarships or in some cases academic aid. While the high school game has exploded coast-to-coast in the 2000s, the unforeseen growth to keep pace among schools fielding a Division I team, has kept the total number of roster spots stagnant, and still essentially confined to an East Coast-based power structure with scattered pockets (Denver, South Bend) elsewhere. Syracuse is flawed, but is that fatal?